In one of the most celebrated destinations in one of the most celebrated countries, you’ll find qualia, Australia’s most celebrated resort. A unique expression of Australian luxury, qualia is situated on the secluded northern-most tip of Hamilton Island. The private resort is a truly special place where everything has been meticulously considered to relax the mind yet completely spoil the senses. Situated in the Whitsundays, qualia puts the wonders of the Great Barrier Reef on your doorstep. With direct flights from international gateway cities on Australia’s east coast including Brisbane, Sydney, Melbourne and Cairns, qualia is the perfect final destination for an Australian holiday, allowing you to unwind and reflect before the journey home. Relax in the Windward Pavilion. Once you settle into your Pavilion, boasting views of either the Whitsundays or tropical bushland, take the time to explore your unique surroundings. Hamilton Island is abundant in Australian flora and fauna, and you may be lucky enough to encounter native wildlife during your stay. The Whitsundays region is well known for breathtaking sunsets. Take in a magnificent palette of colors as the sun sets into the horizon while you enjoy canapés and refreshments on qualia’s luxury charter cruiser, Atomic. 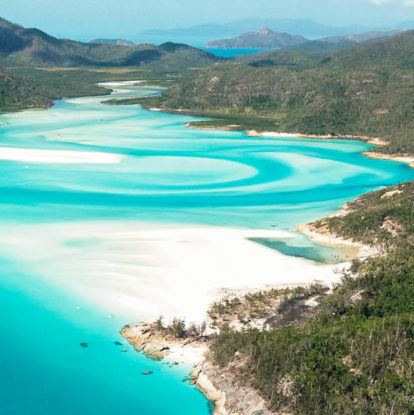 Embark on a signature qualia experience with a discovery helicopter tour over the Whitsunday Islands for a bird’s eye view of iconic landmarks such as Whitehaven Beach, Hill Inlet and Heart Reef. Midway through your flight, touchdown at Reefworld where you can snorkel and swim the famous Great Barrier Reef. Dine at qualia’s beachside restaurant, Pebble Beach, where you can indulge in the finest Australian produce. This contemporary experience features seasonal, sustainable and ethically sourced produce prepared by the restaurant’s Executive Chef. Hamilton Island offers some of the most spectacular nature walks in the region. Discover secluded, sandy coves or climb to the top of the island for stunning 360 degree views of the Whitsundays. Later, invigorate your mind, body, and soul with a signature treatment at Spa qualia. Positioned to catch the soft sea breezes and tranquility of your beautiful surroundings, Spa qualia is the ideal place to unwind before heading home.